Local plumbers in Austintown, Ohio have seen some pretty unusual things, but this was on the stranger side even for them. 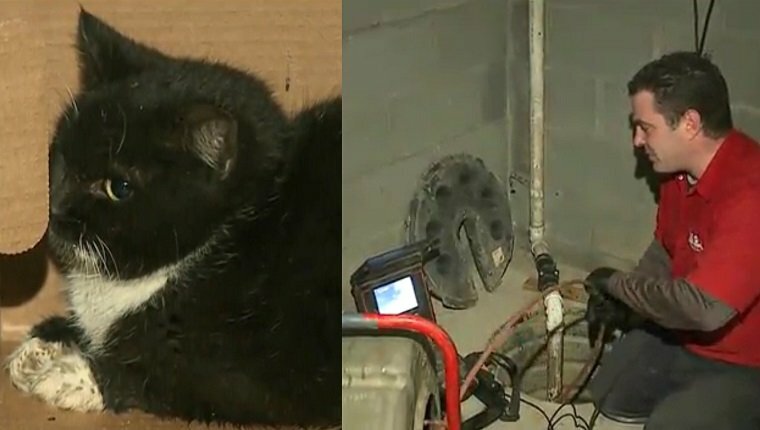 A family’s kitten had been missing for ten days, and they had all but given up hope when they heard a familiar meow coming from the basement. They searched everywhere, but the cat was nowhere to be found. That’s when they realized the sounds were coming from beneath the floor. The cat was stuck in the pipes, so they called the plumbers immediately. Christopher Graham and Joe Kijowski answered the call and immediately drove to the home to save the cat. They used a long snake-like tool with a camera on the end to explore the pipes. When they found the kitten, it didn’t look good. The poor cat had crawled in and was trapped, unable to move forward or backward, and she wasn’t moving. They went to work, pounding through the basement floor to expose the pipe. They worked gradually so they wouldn’t hurt the kitten, breaking through the pipe until they found her tail poking through. Then they backed the kitten out, and she was free. She wasn’t too happy, but after some food and water, the cat started to make a full recovery. The plumbers didn’t even charge the family for the work. They were just happy the kitten was alright. As a thank you, the family decided to re-name the kitten after the plumbing company, Mr. Rooter. It’s an unusual name for a female cat, but it seems oddly fitting for such a strange story. Has your cat ever gotten into a weird situation? Let us know in the comments below!